Puppy separation anxiety isn't uncommon. According to veterinary behaviorists reporting at the Western Veterinary Conference, about 14 percent of pet dogs seen in veterinary clinics suffer from problems being left alone. Puppies adopted before eight weeks of age, mixed breeds and pups adopted from shelters are at highest risk. Animal behaviorists recently have begun to use different terms to describe the condition. That’s because not all dogs become anxious when left alone, although they do act out. Separation distress doesn’t necessarily mean the pup feels anxious and probably is a more accurate description of dogs displaying separation behaviors. Separation behaviors encompass a whole range of activities that might take place as a result of the puppy being left alone. Many times, dogs act out because they’re stressed or anxious at the owner’s absence. Affected puppies feel over-attachment to one or more family members. Problems develop when the amount of time you spend with the pet changes. Puppies learn to become comfortable with their new routine, and a change in routine perhaps due to kids returning to school, your new job, new dog introduction or baby can cause puppy stress. The puppy follows you around the house and becomes increasingly upset as you prepare to leave. When left alone, affected pups act anxious or distressed, often become extremely vocal, and sometimes forget house training. They may destroy property either to escape or as a way to relieve stress. 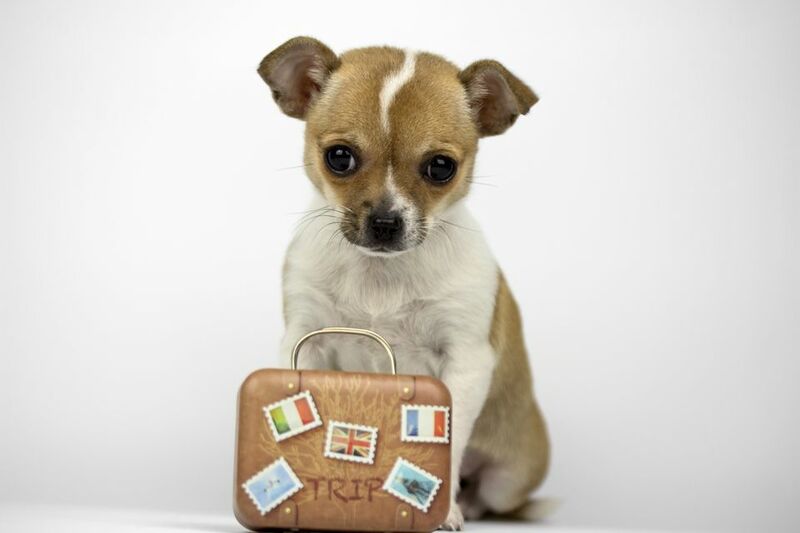 Many pups with separation anxiety target personal items. For instance, they chew up your shoes or a favorite purse. They aren’t retaliating for being left alone. Because these items smell like you, that can trigger anxiety that prompts destructive displacement behaviors. Puppies may also seek out objects that smell like you because your scent comforts them. But some behaviorists suggest that separation behaviors such as emptying your sock drawer or chewing up the toilet paper may arise out of boredom. This could be the canine equivalent of a teenager left alone by parents and throwing a party. About the only way you can tell the difference is to set up a video camera while you are gone, and have it looked at by a behaviorist to see if the dog shows anxious behavior or simply appears to have a good time disemboweling the sofa cushions. In a similar fashion, pups may forget potty training. Older pups might even decide to mark with urine or defecate on something that smells like their owner. This isn’t to get back at you, but instead is the pup’s attempt to self-soothe. Pets should never be punished for any anxiety-based behavior because punishment makes it worse. If your puppy exhibits destructive separation behaviors, you can take steps to reduce the problem. Your veterinarian may prescribe drug therapy that relieves the angst, such as Clomacalm (clomipramine hydrochloride), or Reconcile (Prozac or fluoxetine). But drugs alone won't be a magic wand. The most intense acting out happens within the first 20 to 30 minutes after you leave, and how long you're gone doesn’t seem to matter. So if you can distract the puppy during this critical period, much of his upset feelings will be relieved, and destructiveness may be eliminated. Desensitize the puppy to the triggers of departure. Pick up your car keys fifty times—but then don’t leave. Put on your coat or open the door a dozen times, then stay inside. Repetition of these cues makes them lose meaning so the pup doesn’t get upset, and remains calmer when you actually do leave. Stage absences to build up the puppy’s tolerance level. Leave for one minute, two minutes, four, ten minutes and so on. Do this ten or fifteen times in a row so that (just like with the keys) so the repetition makes it less important to the pup. Make sure the puppy gets lots of exercise before you leave and after you return home. A tired pup is a better-behaved pup. If he’s worn out, he’ll snooze rather than chew up the cushions. Soothing music can also help calm anxiety. I like to use harp music, which acts as a natural sedative and keeps anxious dogs peaceful. Bach flower essences also can help dogs with anxieties. You can add the drops to the puppy's water bowl for all day sipping. You can also offer puzzle toys filled with tasty treats, and hide them around the house for the puppy to find. When he’s thinking and hunting for treats, he can’t worry or develop a full-blown panic attack.